Traveling through most of South Dakota is one trek that most people dread. Between the length of the state, most drivers put the gas pedal down and go. It helps that the speed limit is 80mph. Driving through, we had one goal in mind, to get to the Black Hills. It’s what most people are driving for too. But driving through, I found most of the stereotypes of the Midwest were shattered. And if you go too fast, you’ll miss all the interstate 90 attractions. 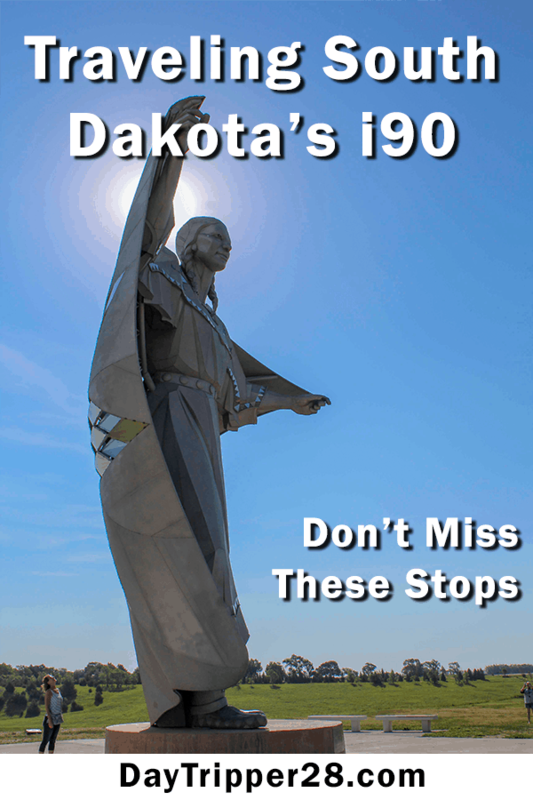 Because some of the best attractions in South Dakota are right off I90. This post contains affiliate links. Making purchases from the links I will earn a small commission at no additional cost to you. I never recommend products that I do not use myself. The businesses in South Dakota have taken marketing to a whole new level. They know that most people are just passing through, so they utilize every marking technique the book to lure you off the highway. In what could seem like an annoyance of billboards, they become a staple that you look forward to on your drive with their quirks and charm and humor. Here are a few places that you don’t want to miss. Everyone knows attractions like Mount Rushmore, Crazy Horse, Deadwood, Sturgis, and the Black Hills. I’m talking about the places on your way to the final destination. Spearfish is just north of the more touristy Deadwood. If you are looking for a place to stay close to the action, but feels like you’re a world away from the crowds, Spearfish is it. With vast fields, canyon there is tons of hiking for visitors. If you just have a short amount of time, stop at Bridal Veil Falls. The 60ft high falls are the most accessible waterfall in the canyon. Keep going you’ll meet up with Devils Tower. Still attached to i90 but a crosses the border into Wyoming. Instead of going as fast as you can though South Dakota to your destination, slow down and make the journey part of the destination. Stop and enjoy the billboards. Enjoy the smaller towns and see what they have to offer. If you need any more inspiration on what makes South Dakota, pick up a copy of Where the West Begins by Phil Schermesiter. You will be ready to set off on your adventure immediately.